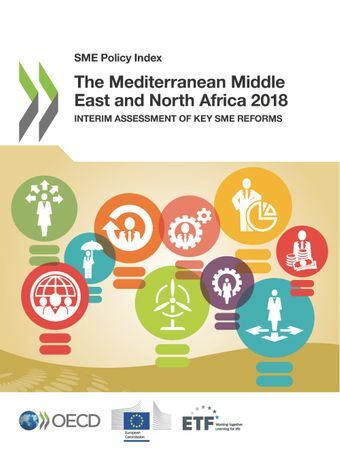 This report provides an in-depth analysis of major reforms undertaken between 2014 and 2018 to promote micro, small and medium-sized enterprise development in Algeria, Egypt, Israel, Jordan, Lebanon, Morocco, the Palestinian Authority and Tunisia. The report focuses on five strategic areas for SME policy making: SME definitions, statistics and institutions; improving business environments for SMEs and entrepreneurs; fostering access to finance; nurturing start-ups and SME growth; and the development of entrepreneurial human capital.The report aims to showcase good practices and to point to areas where more efforts are needed. It provides valuable guidance for governments, private sector organisations, multilateral bodies and other stakeholders to intensify their efforts to support SMEs as essential vehicles for jobs and competitiveness. This is particularly relevant in a region striving to boost economic diversification, employment creation and the inclusion of youth and women in the economy.The report is the result of a process of close collaboration among governments, the OECD, the European Training Foundation and the European Commission.